Benefits of Bariatric Surgery: You will eat less amount of food if you feel fuller even after eating a small amount of food. That’s what bariatric surgery does and how it helps obese people lose weight. It enhances weight loss for obese people who have not yet achieved long-term success with other attempts to lose weight. Bariatric surgery aims at reducing your stomach’s storage capacity, limiting food intake, and makes you feel full sooner than normal. 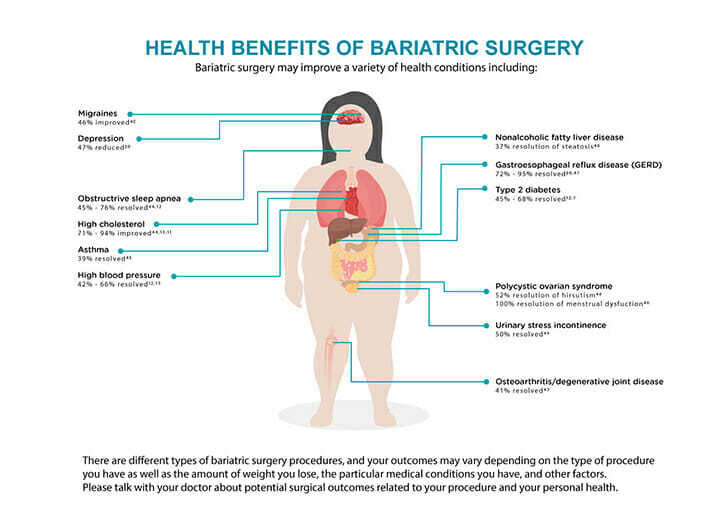 There are several bariatric surgery options. These include sleeve gastrectomy, gastric plication, gastric bypass, and gastric banding. If you are a candidate, your doctor can help analyze each of these options and determine what’s best for you. People who have had bariatric surgery tend to have ‘small’ stomachs and are believed to take tiny bites. One of the most challenging dietary adjustments after bariatric surgery is that you can’t take fluids while eating. You are advised to take fluids at least 30 minutes before or half an hour after eating. It’s also important to take vitamins and other supplements recommended by a nutritionist or your doctor who counsels patients after the surgery. Bariatric surgery can decrease your risk of coronary heart disease, peripheral heart disease, and stroke. It helps keep cholesterol levels and blood pressure to the right level, reducing the risk of heart-related health problems and improving your overall well-being. According to a recent study carried out by Cleveland Clinic, bariatric surgery can cause long-term remission of type 2 diabetes – a difficult-to-control health condition. The study revealed that the procedure is more effective for obese patients battling with type 2 diabetes. Bariatric surgery, according to the study, allows nearly all these patients to remain free of insulin and an adjunct prescription for a minimum of two years after the surgery. Most obese people feel depressed because of their physical appearance and probably social stigma. Even young people battling with excess body weight find it challenging to participate in activities they may otherwise enjoy, leading to depression and social isolation. Shedding of these extra pounds can enhance emotional health in these individuals. Being overweight puts a lot of stress on various weight-bearing joints, causing joint pain and in worst cases, joint damage. The sustained weight loss associated with bariatric surgery can relieve the stress on your joints, allow you to stop using pain medication and enjoy better mobility. Reaching a significant and sustainable normal weight range allows individuals with sleep apnea to skip the use of a CPAP machine during bedtime. Obesity is associated with many health complications for most Australians. Bariatric surgery represents an effective tool for offering a sustained relief for people desiring to lose weight. Previous Reputation Management ORM – Why It Is So Important?